I did this walk on the 31st May 2009. There is a train service that links Manningtree and Harwich and thus for the first time on my walk along the Essex Way I was able to undertake a linear walk. Normally when I walk between stations I park at my destination and then take the train to the start, (it saves waiting around at the end of walk and means I can time the connections better) however as I had never been to anywhere near Harwich before I thought I would drive to the start at Manningtree and then get the train back. 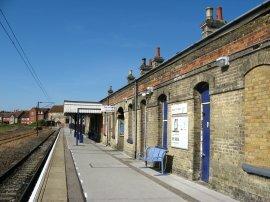 I had an early start and arrived at the Manningtree Station just after 9:00am. The day had dawned bright and sunny and it stayed that way all day, ending up the warmest day of the year so far in many parts of the country which was a marked change from the weather I had during the earlier stages of the walk. There was also a steady breeze blowing which helped keep the temperature to a decent level for walking. From the station it was just over 0.6 of a mile back up to St Mary's Church at Lawford, photo 1, where I resumed my walk along the Essex Way. The route heads down a path that runs alongside the church which leads out into open fields. The path headed gently downhill to cross over Wignall Brook through a field being grazed by sheep before heading up to join a farm track that runs down to the A137 at Cox's Hill on the outskirts of Manningtree. Away to my left I caught the odd glimpse of Manningtree Station in the valley below along with the occasional view down to the Stour Estuary, photo 2. As I was crossing the road an old man driving by stopped and asked for directions to London which I gave as best I could though I'm not sure how much he grasped of the route along to the A12 that I described. 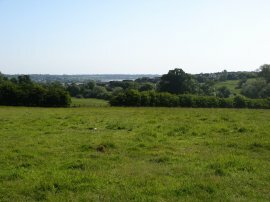 I then headed briefly downhill along the road to join a footpath that run through a small area of parkland before heading diagonally over a field to join a broad suburban path running behind houses. The field had been deeply ploughed and the smooth path across it was a bit like a miniature roller coaster heading up and down over the furrows. The route crosses over Colchester Road and continues along Mill Hill, the route now running parallel to the railway lines. The route passes a waterworks and turns left at Brook Street to cross over the railway lines before turning to the right into South Street. South Street, photo 3, is followed downhill, past a number of fine building towards the Estuary although as so often happens the views of the best buildings were heavily obscured by parked cars. 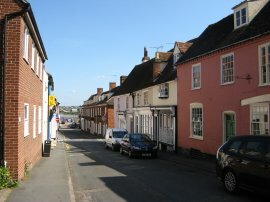 South Street crosses Manningtree High Street and continues the short distance down to Quay Street where the route follows the road round to the right and soon joins The Walls, running alongside the estuary, photo 4. 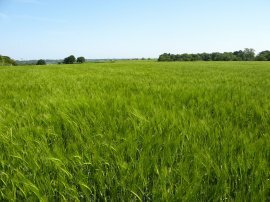 Although it was near the start of the days walk it felt like a major achievement to reach coastline and I was in an exceptionally good mood as I headed down the road towards Mistley. 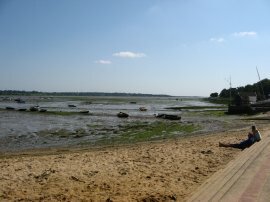 It was low tide and a large expanse of mud flat was exposed with only a small central stream running down the estuary towards the sea. 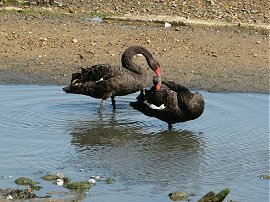 At one point beside the estuary was an area occupied by a very large flock of swans, probably at least 100, and including a few black swans, photo 5. 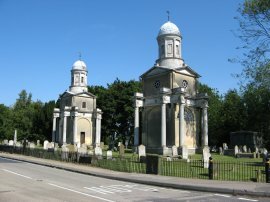 The route continues alongside the road heading slightly inland as the road passes by the Mistley Towers, photo 6, which are the twin towers of the now demolished Church of St. Mary the Virgin at Mistley in Essex. 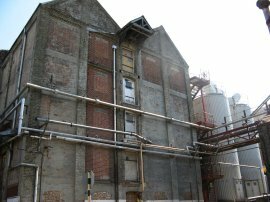 A short distance further along the road, now known as Mistley High Street, the route joins a footpath that runs through the car park and delivery bays of a large factory unit belonging to the EDME Malt Extract Works, photo 7. The route follows a marked path, accompanied by many health and safety notices, through to a large metal gate at the end of the works. It was hard to get a decent photo of the site however it was very interesting looking at all the different architecture scattered around the area, the company having been established in the 1880's. The path then heads through a small patch of trees before passing under the railway lines and entering a field. Looking back all that was visible of the works was a tall brick chimney bearing the name of the company. 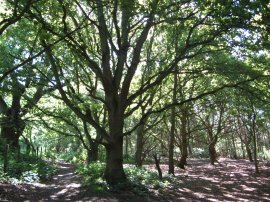 After crossing a second field the route heads to the left and passes through woodland of Furze Hill, photo 8, which contained a number of very large old trees. Leaving the trees the route heads between a number of fields Mistley Heath. 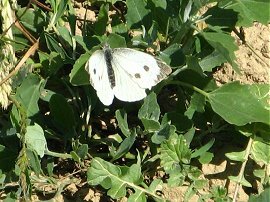 Crossing Heath Road the route continues ahead over fields which had been planted with Brassicas and were proving popular with both the white butterflies, I think photo 9 is a large white, as well as with the Painted Ladies of which I have seen a lot while out just recently. The path then crossed over another field planted with barley, photo 10, whose stalks were still a youthful green colour in the bright morning sunshine. Leaving the fields the route continues ahead along Mill Road into the village of Bradfield. At the end of the road the route turns to the left along "The Street" before turning to the right along the B1352 Harwich Road. Reaching the edge of the village the Essex Way then joins a footpath on the left that starts heading diagonally across a couple of fields heading downhill to pass back under the railway lines. One of the fields was planted with a crop that was covered in purple and mauve flowers which looked some relation of the pea family although I'm not exactly sure what. The Stour Estuary was visible between the red brick arch that took the path under the railway lines from where it was just a short walk across another field to join a track that run alongside the marshy fringes of the estuary itself, photo 12. 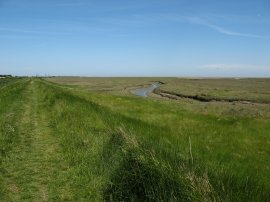 The path then follows the edge of the estuary towards the Wrabness nature reserve where the route heads slightly inland. 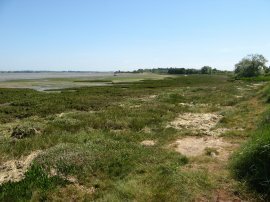 The nature reserve covers 52 acres on the banks of the river Stour estuary and occupies the site of what was once a former mine depot established in 1921 by the Ministry of Defence. Although this closed in 1963 there is still evidence of the roads that once ran across the site. 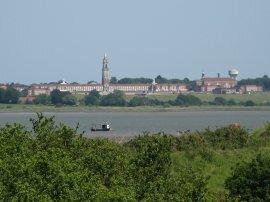 I stopped and had my first break of the day in the nature reserve on a bench that overlooked the impressive buildings of the Royal Hospital School on the far bank of the estuary, photo 13. Leaving the reserve the path heads briefly back down to the edge of the estuary before joining a long, straight, hedge lined track that heads steadily inland to join Church Road on the outskirts of the village of Wrabness. The route then heads along the road towards All Saint's church, photo 14. 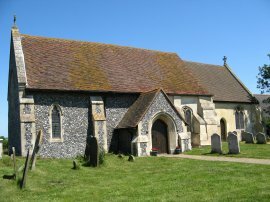 The oldest building in the village is All Saints' Church, which dates from around 1100. 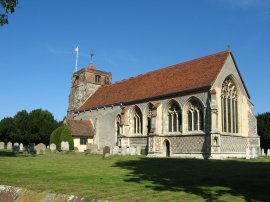 The church's bell tower collapsed in the seventeenth century, and the bell moved temporarily to a wooden bell cage in the church yard where it remains to this day. 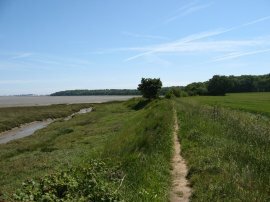 A little past the church the Essex Way joins a track on the left that heads down besides a caravan park to rejoin a path running just above the edge of the estuary, photo 15. 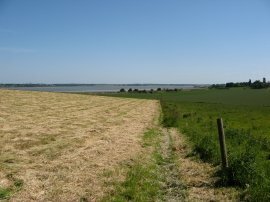 This section of path is followed for just under one and half miles with fields to the right and the estuary on the left, often obscured by a small band of trees that grew right down to the water edge. The path passes through a small path of woodland at East Grove before eventually reaching Copperas Wood where the path starts heading uphill through the trees and away from the estuary. As I had been walking down the estuary the docks at Felixstow had been growing ever larger on the horizon although these disappeared from view once I entered the woodland. The route crosses back over the railway lines that run up to Harwich for the final time and joins a track that heads up to the B1352 Wrabness Road. The route turns to the left along the road for about 400 hundred yards before taking a footpath on the right along a farm track. This heads besides a couple of fairly open fields before crossing another small section of field. 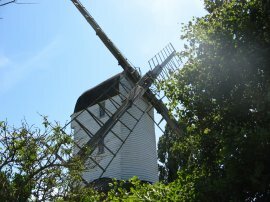 The route then heads towards the left heading past the windmill in photo 16 as the Essex Way makes its way towards the village of Ramsey. Entering the village the route turns to the left along the Street before passing a pub and turning to the right along Main Road. This short stretch of path takes the route over a small stream to the junction with the rather busy A120. Once over the road the path heads up Church Hill for a short distance before joining a footpath on the right besides an old nursery which soon leads out into more open ground, the path rising gently uphill with paddocks on the right, photo 17. Reaching a field edge the route once again turns to the left and heads down to a cross a road before continuing diagonally across a field, the path at this point slightly re-routed from the course marked on my map, to join a reasonably well surface farm track. 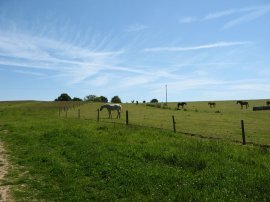 This track starts heading downhill with good views over the surrounding fields towards the North Sea coast, photo 18. Out at sea I could see a large cargo ship making its way towards the docks at Felixstow and on the far horizon the Walton on the Naze tower. At the end of the field the route turns to the left along a cross track before soon turning right to join a footpath that runs between fields to eventually reach the sea wall. There was a reasonably strong breeze blowing off the sea and inland face of the grass covered sea wall made an ideal place to sit out of the wind while I ate my lunch. At first there was a large expanse of salt marsh between the actual sea and the sea wall but as I gradually approached the caravan parks at Dovercourt the sea became steadily closer. 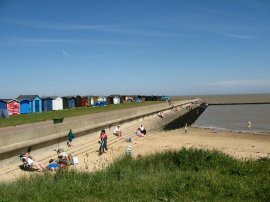 Eventually, by a small sandy beach backed by a line of brightly coloured beach huts, photo 20, I reached the tarmac promenade which the Essex Way follows for the remainder of its route to Harwich. 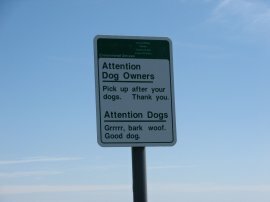 There was also an amusing sign, photo 21, directed at dogs and their owners. 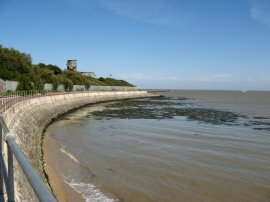 Heading along the seafront promenade the path passes by the Dovercourt Higher Lighthouse, photo 22. This cast iron lighthouse was erected by Trinity House in 1863, and along with the Dovercourt Lower Lighthouse which is situated a short distance off shore, was used until 1917 to guide ships around Landguard Point with their powerful gas lamps. 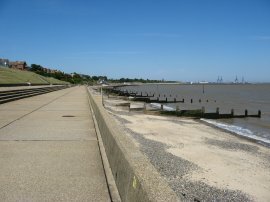 The beach areas closest to the centre of Dovercourt were quite busy and there were even a few people paddling in the sea however as I headed along the promenade towards Harwich the seafront gradually became quieter, photo 23. Eventually I spotted a perfect spot on the beach to have a little rest in the early summer sunshine, the groyne providing a more than adequate windbreak, photo 24. I could have sat on the beach for ages, watching the tide coming steadily in, however after half an hour I thought it was probably time to make a move and complete the last mile of so of the walk. The path curves its way round Beacon Cliff, photo 25, and passes a low breakwater that stretches out into sea. 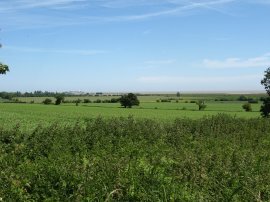 Once round the corner of the low cliff I could once again see the cranes of the Port of Felixstow in the distance ahead of me, photo 26. 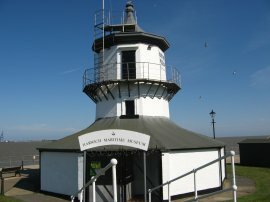 The path continues along to reach the Lower Light Lighthouse which now houses the Harwich Maritime museum, photo 27. 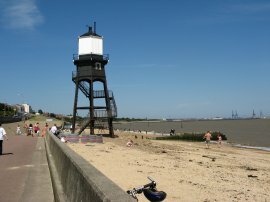 From the Lower Light it was just a few yards walk across the open space of Harwich Green to reach the 90ft high and nine sided Higher Light, photo 28, which marks the official end of the Essex Way. 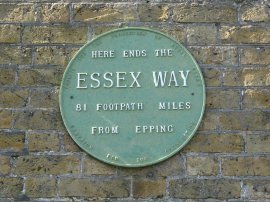 On one of the sides there is a small green plaque, similar to the one on the walls of Epping underground station marking the end of the path, photo 29. 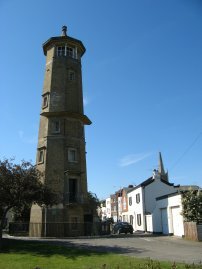 From the lighthouse it was just a short walk across Main Road and down Station road to Harwich Station, photo 30. At this point I had walked 16.9 miles. I had half an hour to wait for the next train so took the opportunity to have a brief trip down to the pier before taking the train back to the car at Manningtree. It's an often used comment of mine at the end of the walks that I found them very enjoyable however this walk really was one of the most enjoyable that I have ever done. Despite having a heavier rucksack than normal with beach towel, swimming trunks and a change of clothes and three litres of water, the day flew by and the walking felt effortless, the first 12 miles seeming only half that distance. The excellent bright weather helped, along with the achievement of completing the entire walk and exploring an area I had never been to before. My feet were fine, despite the problems I had had with blisters on the previous stage and the reasonably long stretch of tarmac path along the seafront at the end. 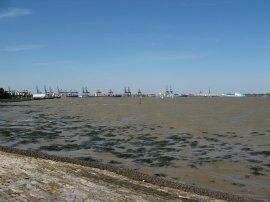 The scenery was varied; the walk along the estuary very enjoyable, and Harwich and the nearby docks were particularly interesting. It was also nice to have the chance to sit on the beach and reflect on the walk especially back to the snowy paths in February. After the Downs Way, which seemed to go on for ever, I was happy that I had finished this walk by the end of May, despite this being the only stage that did not require a "there and back" walk.